The MAX3316 MAX3317 MAX3318 MAX3319 transceivers have a proprietary low-dropout transmitter output stage enabling RS-232-compatible performance from +2.25V to +3.0V with a dual-charge pump. These devices require only four 0.1F capacitors, and are guaranteed to operate at data rates up to 460kbps. 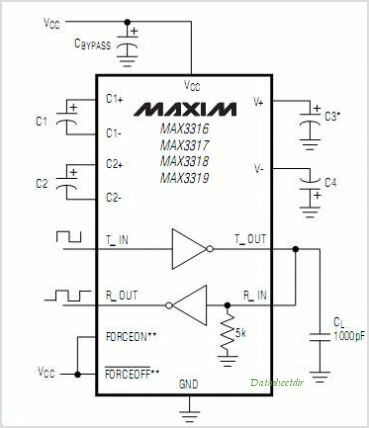 The MAX3318 MAX3319 achieve a 1A supply current using Maxim's revolutionary AutoShutdown Plus feature. These devices automatically enter a low-power shutdown mode when the RS-232 cable is disconnected or the transmitters of the connected peripherals are inactive for more than 30 seconds. They turn on again when they sense a valid transition at any transmitter or receiver input. AutoShutdown Plus saves power without changes to the existing BIOS or operating system. The MAX3318 is a 2-Tx/2-Rx device while the MAX3319 is a 1-Tx/1-Rx device. These devices also feature a logic-level output (READY) that asserts when the Charge Pump is regulating and the device is ready to begin transmitting. The MAX3316 MAX3317 are 2-Tx/2-Rx transceivers. The MAX3317 features a 1A shutdown mode that CAN be entered by driving active-low SHDN low. The MAX3317 's receivers remain active while in shutdown mode, allowing external devices such as modems to be monitored using only 1A supply current. 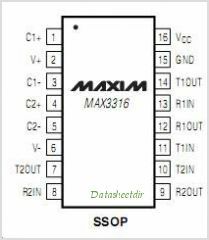 These devices are available in space-saving packages: MAX3316 (16-pin SSOP and 20-pin TSSOP), MAX3317 MAX3318 (20-pin SSOP and 20-pin TSSOP), and MAX3319 (16-pin SSOP). This is one package pinout of MAX3316,If you need more pinouts please download MAX3316's pdf datasheet. This is one application circuit of MAX3316,If you need more circuits,please download MAX3316's pdf datasheet.